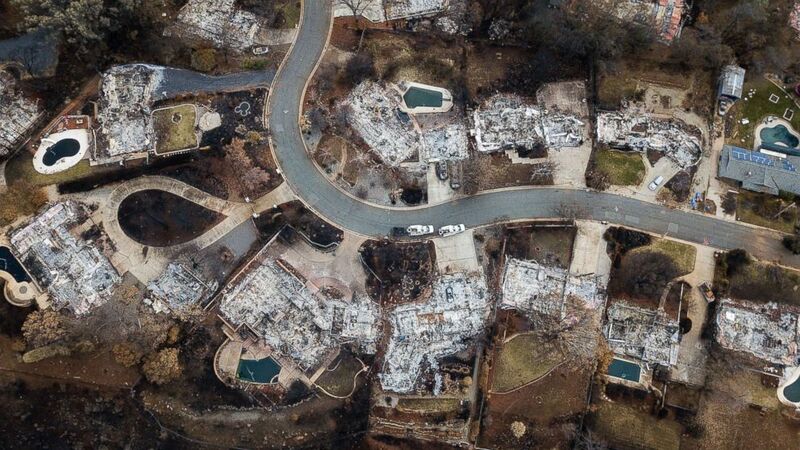 It's been one month since the deadliest wildfire in state history ignited. It's been one month since a pair of wildfires erupted at opposite ends of California, sparking a weeks-long onslaught of flames that killed dozens of people and burned entire communities to the ground. The Camp Fire ignited Nov. 8 near Pulga, a tiny community in Northern California's Butte County, nestled in a corner of the Plumas National Forest. That same day, the Woolsey Fire ignited near the city of Simi Valley in Southern California's Ventura County. Both blazes exploded as strong winds fanned the flames south. In all, the two wildfires laid waste to a total area of nearly 400 square miles before firefighters fully contained the flames on Nov. 21, according to the California Department of Forestry and Fire Protection. The causes of the ferocious fires remain under investigation. 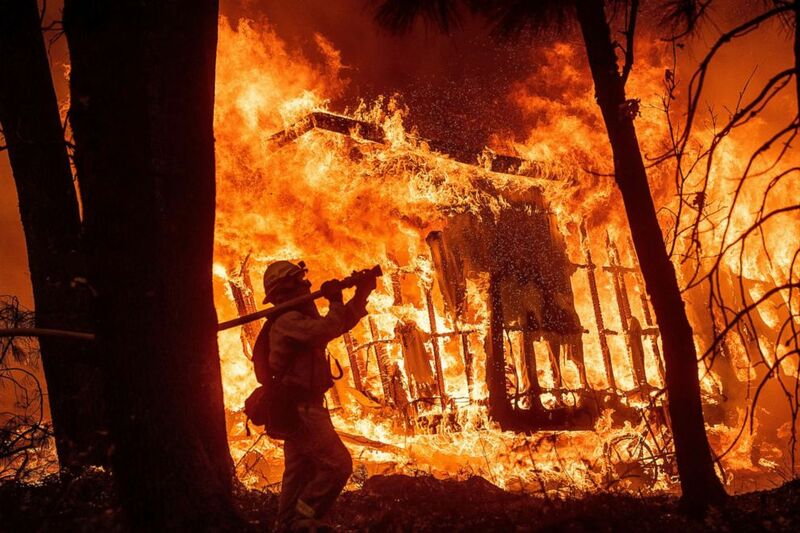 (Noah Berger/AP) Firefighter Jose Corona sprays water as flames from the Camp Fire consume a home in Magalia, Calif., Nov. 9, 2018. The Camp Fire, the larger of the two, swelled to more than 153,000 acres and destroyed nearly 14,000 homes in Butte County over the course of 18 days. At least 85 people died from the explosive blaze, and the remains of 47 have been positively identified, according to the Butte County Sheriff's Office. It's now the deadliest and most destructive wildfire in California history. 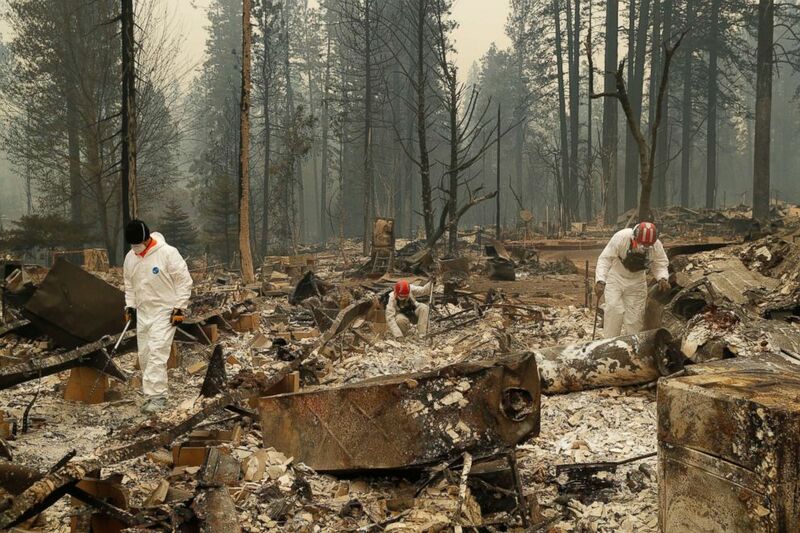 (John Locher/AP) Search and rescue workers search for human remains at a trailer park burned by the Camp Fire, Nov. 13, 2018, in Paradise, Calif.
At one time, there were over a thousand names on a list of people missing or unaccounted for in Butte County amid the Camp Fire. That list has since been revised down to just three names of people who lived in the town of Paradise, a bucolic community of 27,000 people in the Sierra Nevada foothills that was virtually decimated by the Camp Fire. Many of the deaths occurred there. (Noah Berger/AP) Homes leveled by the Camp Fire line Valley Ridge Drive in Paradise, Calif., Dec. 3, 2018. Since evacuation orders were lifted, some homeowners have returned to see what's left of their properties. Paradise resident Andrea Gaylord lost everything in the devastating blaze. But she was surprised and overjoyed to see that her beloved dog, Madison, had survived and was waiting patiently where their house once stood. "Imagine the loyalty of hanging in the worst of circumstances and being here waiting," Gaylord told ABC Sacramento affiliate KXTV on Friday. "It was so emotional." 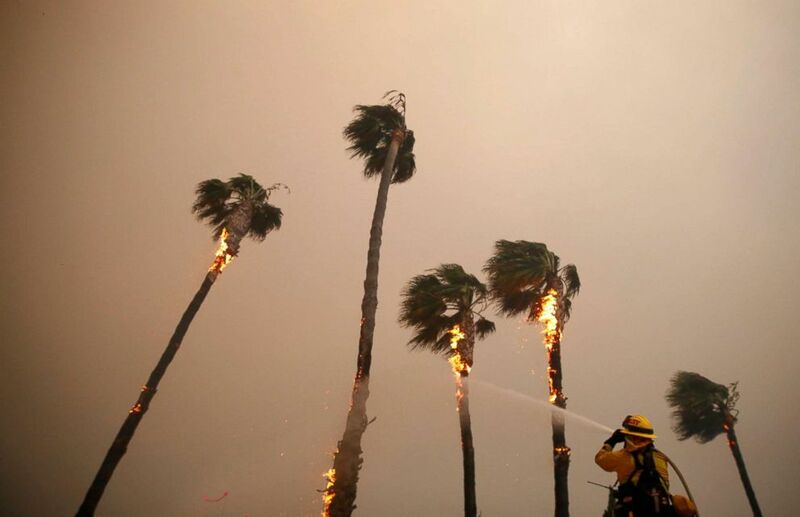 (Eric Thayer/Reuters) A firefighter sprays down palm trees as the Woolsey Fire burns in Malibu, Calif., Nov. 9, 2018. The Woolsey Fire, which started in Ventura County, grew to nearly 97,000 acres while spreading into Los Angeles County, where the flames jumped the 101 Freeway before ripping through the celebrity enclaves of Malibu and Calabasas. 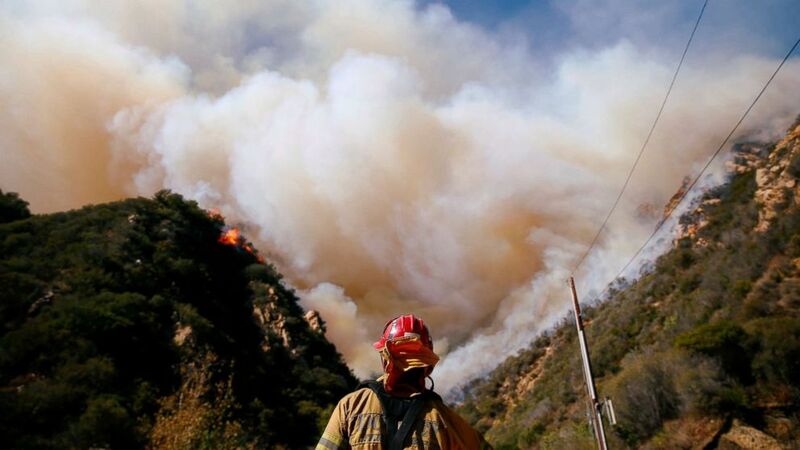 It destroyed more than 1,600 structures and killed three people, according to the Los Angeles County Fire Department. The blaze burned down a portion of Paramount Ranch in Agoura Hills known as "Western Town," where hundreds of movies and television shows, including HBO’s "Westworld," have been filmed. U.S. Health and Human Services Secretary Alex Azar declared a public health emergency in California after the wildfires forced the evacuation of at least two hospitals and eight other health facilities. Meanwhile, the smoke from the flames descended across the Golden State and choked the air in major cities. Berkeley Earth, a California-based nonprofit that analyzes air quality in real-time, ranked San Francisco, Stockton and Sacramento as the world's three "most polluted cities" on Nov. 16.